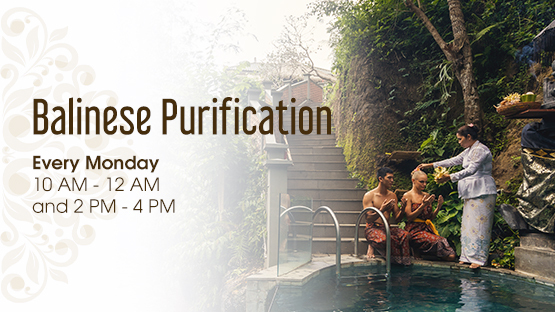 Known as Melukat in Balinese, the austere Purification and Cleansing Ceremony take about 30 minutes. Under the non-stop supply of Sacred Springs Water, the body's spiritual power through the 7 Chakras focal points will be purified and cleansed. Proper sarong attire & avoidance of female monthlies must be adhered to for rendering full Hindu religious compliance and respect please. Every Monday, 10 AM - 12 PM; 2 PM - 4 PM. Only IDR 150,000++/person. 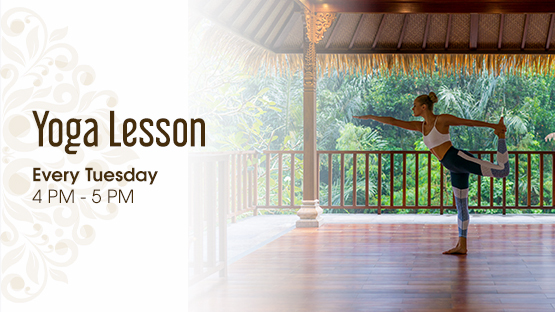 Yoga does more than burn calories and tone muscles. It's a total mind body workout hat combines strengthening and stretching poses with deep breathing and meditation or relaxation. Every Tuesday, 4 PM - 5 PM. 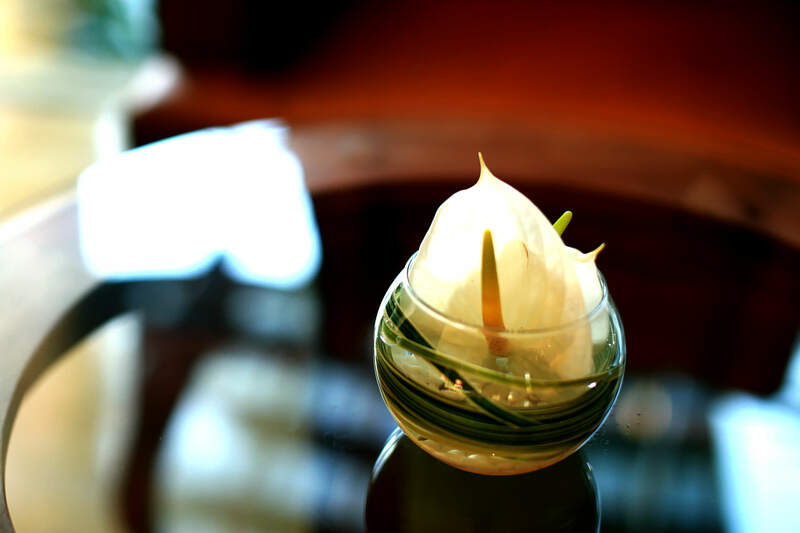 Canang sari usually consists of a container, which is made of woven coconut leaves and filled with various ingredients such as rice, flowers, fruits and spices. All of these ingredients have different colors and each color symbolizes one if their Gods. When presented, it usually also contains incerse stick. 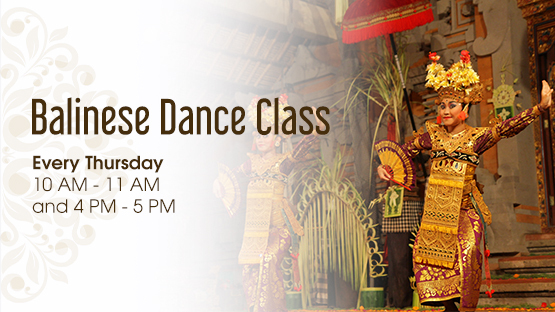 Balinese dance is cultural presentation that is part of the religious and artistic expression. 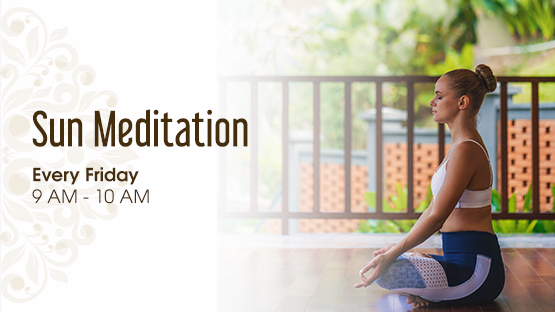 By meditating under the sun, you will get positive magnetic rays from the sun and it will help you remain prosperous, healthy, happy, peaceful, and wise throughout the day in your life. Visit picturesque traditional villages, engage with local villages, and stop by magnificent temples. 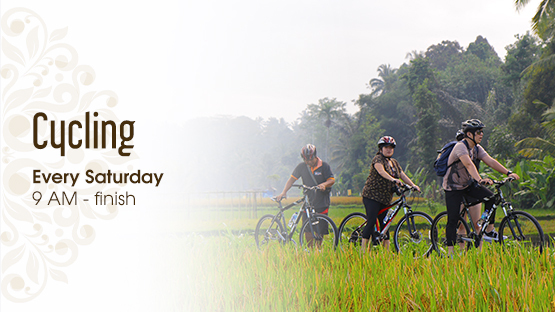 The cycling activity will give you a unique experience and change to discover the "real Bali" off the beaten tracks. 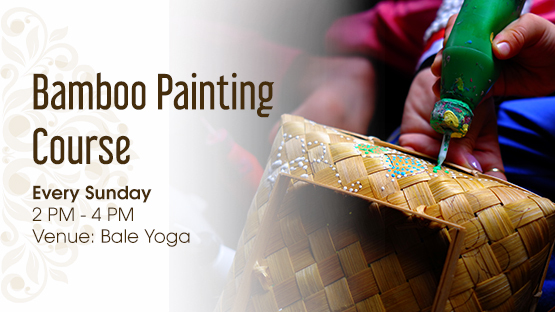 Bamboo Painting, Bali's color crush, on the basis of love and passion to life. 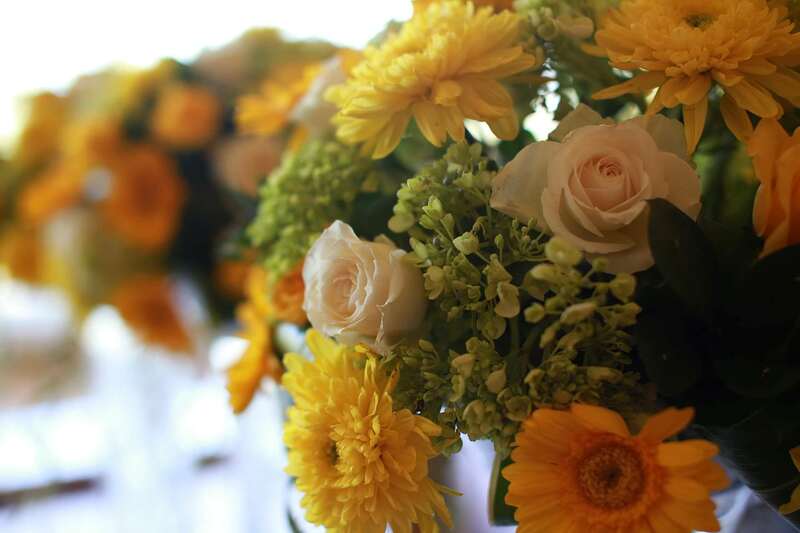 Follow your heart, create your own color with us together. Be yourself, be Balinese. Only IDR 200,000 net/adult and IDR 150,000 net/child (3-16 yo). Inclusions: Well Packed finish craft. More than 5 Pax discount IDR 20,000 per person. 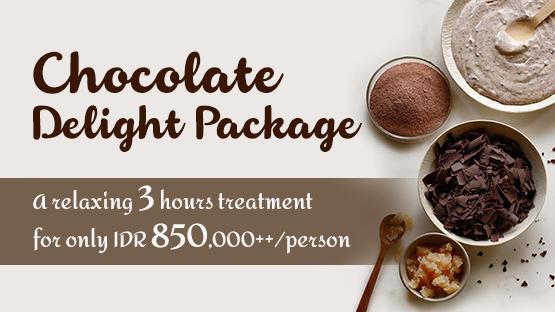 Let us pamper your for 3 hours with this wonderfully deliciuosly treatment which combines chocolate aromatherapy massage followed by a sensational chocolate scrub treatment, both designed to promote blood circulation, toning of your skin and the elimination of toxins. Alsop be indulged in a deep cleansing and calming chocolate facial suitable for all skin types. This purifying facial treatment will leave your skin smooth, highly moisturized and delightfully scented. Salad of air-dried ham, gnocchi fritto & balsamic jelly. Cast iron seared prawns with smoked pimento & potato crisp. Dark chocolate lava cake with vanilla gelato, strawberries & Limoncello.